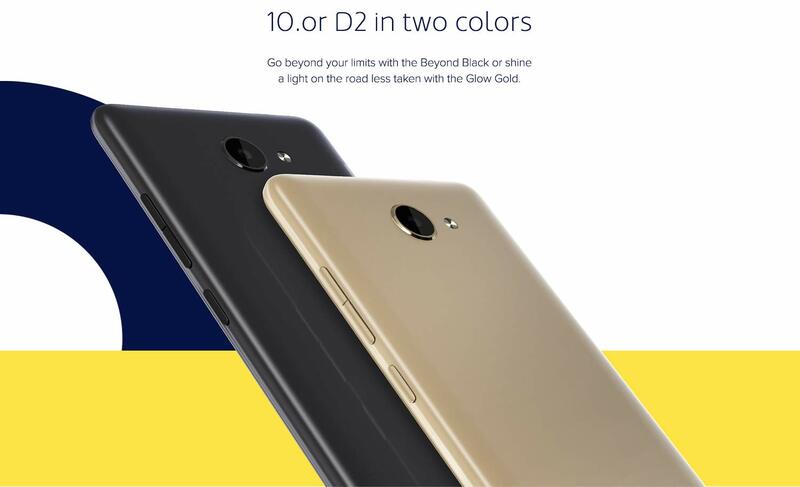 Amazon’s smartphone brand 10.or (pronounced Tenor) launched a new phone dubbed as 10.or D2 in India today. The key highlights of the 10.or D2 are a 5.45-inch HD+ 18:9 display, Snapdragon 425 processor, Android 8.1 Oreo, 13MP rear and 5MP front camera. The 10.or brand debuted in India last year in September. The company has already launched three budget smartphones in India viz 10.or G, 10.or E, and 10.or D. The new 10.or D2 is the successor to last year’s 10.or D.
The 10.or D2 sports a 5.45-inch HD+ (1440 x 720 pixels) IPS 2.5D curved glass display with 18:9 aspect ratio. The smartphone features anti-fingerprint coating and also has water-protection with IPX2 splash resistant rating. Powering the phone is a Quad-Core Snapdragon 425 processor with Adreno 308 GPU. Memory wise, it comes with either 2GB RAM with 16GB internal storage or 3GB RAM with 32GB internal storage. The storage is expandable up to 128GB with microSD. In terms of camera, the smartphone sports a 13MP rear camera with Sony IMX258 sensor with LED Flash and f/2.0 aperture. There is a 5MP front-facing camera with f/2.0 aperture and soft LED flash. The Dual SIM phone runs stock Android 8.1 Oreo and has several connectivity features like 4G VoLTE, VoWiFi, ViLTE, Wi-Fi 802.11 b/g/n, Bluetooth 4.2, GPS + GLONASS, USB OTG, and 3.5mm audio jack. The smartphone packs a 3200mAh battery. Dimensions of the phone are 147.7 x 70.5 mm x 8.6mm and it weighs 144g. The 10.or D2 is priced at Rs. 6999 for the 2GB RAM with 16GB storage version. While the 3GB RAM with 32GB storage version is priced at Rs. 7999. It comes in Beyond Black and Glow Gold colors and will be available exclusively from Amazon.in starting August 28th. If we talk about launch offers, Punjab National Bank or IndusInd Bank Credit or Debit Card holders will get a 10% instant discount on buying 10.or D2. There is also additional Rs. 1000 off on exchange. Moreover, Reliance Jio users will get Rs. 2200 cashback. Amazon also offers up to Rs. 200 off on Kindle eBooks. There is also no cost EMI options on major credit cards as well.